Home Architecture Will Live Nation or Goldenvoice Take Over the Warner Grand? The Warner Grand has been the anchor of downtown San Pedro for 85 years. The art deco movie palace continues to show movies and also has a full schedule of ballet, stage plays, and even a pops orchestra. It’s the music that caught the attention of councilman Joe Buscaino, who thinks that a big concert promoter like Live Nation or Goldenvoice might be a better operator for the venue than the city of Los Angeles Cultural Affairs Department. The Grand Vision Foundation is a friends group charged with programming the theater and raising funds for restoration. Foundation president Fred Allen recently told the Daily Breeze that neighborhood non-profits might get squeezed out of the venue if a new booker takes over. Live Nation operates the landmark Wiltern and Hollywood Palladium and Goldenvoice books the El Rey and the Fonda, so both have experience in historic venues. I understand Allen’s concerns, but the venue is pretty unique in the harbor cities and can probably support a more robust schedule than they currently keep. 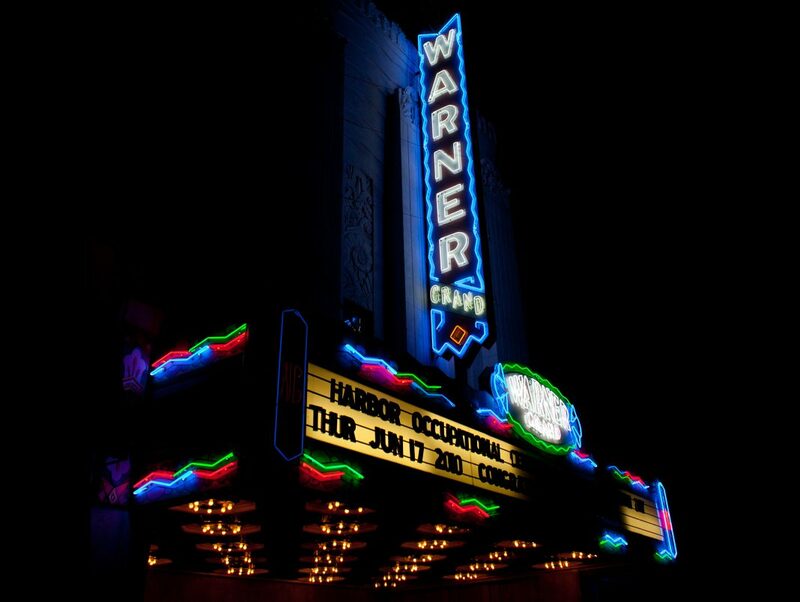 Back in the 1930s Warner built two very similar theaters in Beverly Hills and Huntington Park. The Wilshire location was demolished in 1988, and the other has been sitting vacant for years. If you would like to get inside the beautiful hall in San Pedro, the foundation is hosting a big formal anniversary party for the theater on April 9. See you on the red carpet.